I know. Your first thought when you saw this photo was "Wow, cool dog." Me too. That small, black speck in the frame is Tara, a German shepherd who pulls hard on your heart when you're not with her. She lives in Hawai'i with her person, a longtime friend and whale researcher. You may have noticed something else about this photo (besides my good hair day). Sperm whales. Loads of them. A couple hundred tons of leviathan on the move, each animal the size of a slippery Greyhound bus. And all Tara could think was, "Get outta my yard!" 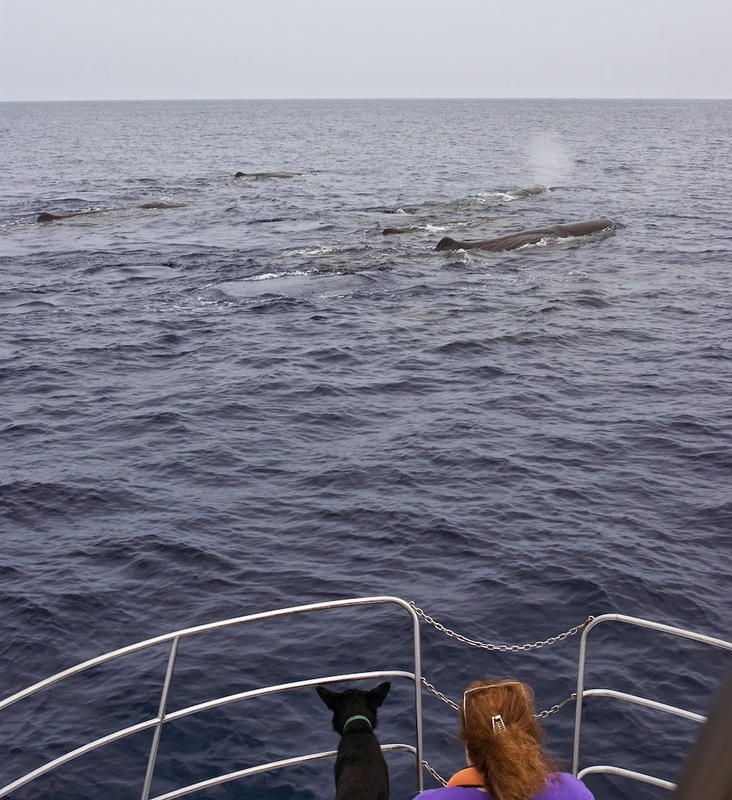 She barks ferociously at whales until, frightened out of their minds, they almost notice her. It's one of her many duties, keeping the whales in the water and off of her boat. And by gawd, she's never had an infraction. Her job's not an easy one, either, protecting a territory that's constantly changing its location. This morning Tara has been on my mind. The protector of her pack--apparently the only one who can even see the danger, much less keep it at bay. And I've been wondering about this idea of territory. What do I have in my life that makes me bolt up from a sound sleep to protect it so fiercely? Maybe even beyond good sense? Today I'm going to figure out what triggers that defensive response in myself, and try to imagine how I could tone it down a bit.